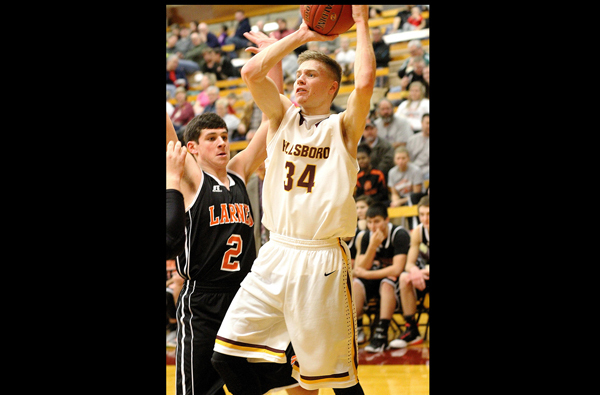 Poor shooting during the final quarter cost Hillsboro a big win over Larned Friday at Brown Gymnasium. The Trojans, leading 33-31 through three quarters, missed 11 of 13 shots down the stretch, enabling the Indians to pull out a 43-39 Central Kansas League victory. ?They defensed us pretty well, but we didn?t execute our offense in a way that would allow us to get good shots,? coach Darrel Knoll said. Both teams came into the game with only one loss, and the game was close from the start. Larned led 12-10 after one quarter, but an 11-2 run to start the second period put the Trojans ahead 21-14 with 4:36 left in the half. Late in the second quarter, with Hillsboro leading 24-20, Austin Cross stuffed a break away basket with 57 seconds left in the quarter, But officials called a technical foul on the 6-foot-7 junior for hanging on the rim. Larned hit both free throws to cut the lead to 26-22 at intermission. The third quarter was ragged for both teams. Hills?boro made three of 10 shots from the floor and committed five turnovers while Larned shot 3-for-12. Preston Loewen?s three-pointer at the 1:12 mark enabled Hillsboro to take a 33-31 lead into the final quarter. When Larned took a 39-36 lead with 3:30 to play, Braden Vogt hit an open three at 1:57 to tie the game. Unfor?tu?nately, the Trojans missed their final four shots to seal the Indian win. ?Once they started gaining momentum down the stretch, we just couldn?t find that shot,? Knoll said. ?I thought Braden shots might get us going in the other direction, but we just didn?t get it done. We?ve got to execute better.? Micah Allen led Hillsboro (5-2, 1-1) with 11 points on 4-for-15 shooting. Isiah Perez led the Indians (7-1, 2-0) with 15 points. Lyons?Excellent defense offset a poor shooting night as the Trojans opened Central Kansas League play Tuesday by avenging its only loss of the young season with a 33-29 win at Brown Gym?nasium. ?The guys defended really hard, (Lyons) didn?t get open looks all night,? coach Darrel Knoll said. ?Every shot was contested and I thought we did a pretty good job on the boards.? But he also praised his team?s effort on offense, despite its 26 percent shooting from the floor. ?We ran the floor well, we moved the ball pretty well, we got good shots?we just didn?t put the ball in,? he said. ?The way we were shooting the ball before Christ?mas, we?d have scored 70 points tonight. It was just one of those nights where we couldn?t put the ball in the basket.? A basket by Josh Funk and a traditional three-point play by Austin Cross gave Hillsboro a 7-2 lead with 2:29 left in the first quarter, but Lyons? Grady Kirkhart responded with a traditional three-point play and Dakota Nave hit a long-distance three to give Lyons an 8-7 lead at the first break. Hillsboro managed a 17-14 lead at halftime, thanks to three-point and two-point baskets by Micah Allen and a pair of free throws from Cross in the final 1:58. The Trojans pushed their lead to 26-16 with 1:28 left in the third period. Josh Funk scored four points, Allen, Cross and Preston Loewen each added two to fuel the surge. But Lyons? Eddie Lan?deros banked in an off-balance three-point shot at the buzzer to cut the margin to 26-19. Cross scored a basket and two free throws in the first 1:02 of the final quarter, giving Hillsboro a game-high 30-19 lead. But when the Trojans went dry from the field, the visitors pulled to within 30-26 with 1:09 left. Hillsboro made only one of three critical free throws down the stretch, but Allen scored with 22 second left to stave off the Lions? rally. Allen and Cross led the Trojans (5-1) with 11 points apiece. Kirkhart finished with 14 to lead Lyons (2-5). ?The first game out of Christmas, sometimes things don?t go your way,? Knoll said. ?Tonight, offensively we struggled a little bit?just shooting. The rest of it wasn?t bad. I still like how hard we played, and I think we?re playing pretty well together. It?s just a matter of us completing plays on offense.? Coming?After two games at home last week, the Trojans will be on the road this week. 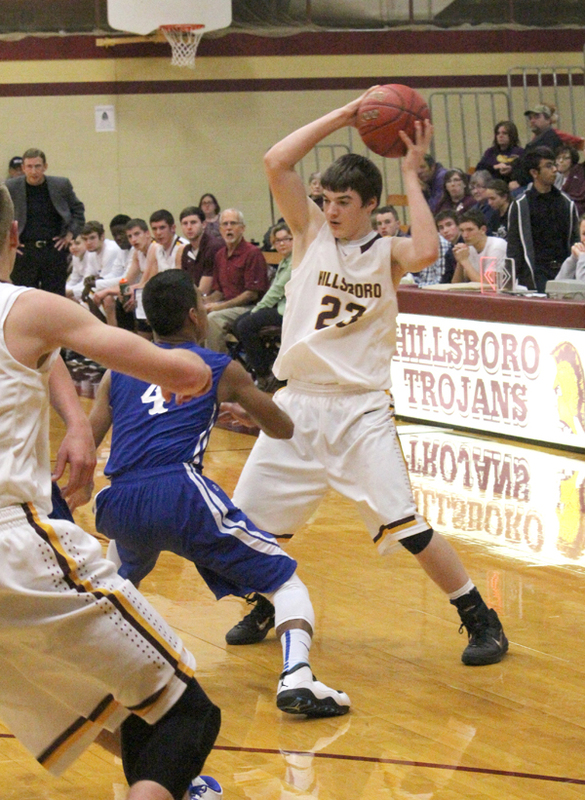 Hillsboro was to play Tuesday at Smoky Valley (1-5), then will travel to Halstead (3-5) Friday.